While We Were Yet Sinners! Yes, God loves us while we are sinners and He does not ask us to “clean ourselves up” before coming to Him for forgiveness and salvation. Romans 5:8 “But God commendeth his love toward us, in that, while we were yet sinners, Christ died for us.” I am much comforted to know God’s unconditional love more each time I think on this verse. I love Easter more with each passing year, as I reflect on how great a love my Lord has for me and all of mankind. I am humbled every day of my life by the fact that Jesus was tortured, mocked, spit upon, and murdered for my sins, but I see no need to repeatedly crucify Him. To me the miracle of His resurrection is most important to stand firm on as my hope for my place in eternity in His presence. I enjoy reading each of the apostles’ account of Jesus’ Resurrection, but the one that speaks most to my heart and soul is John’s (the disciple whom Jesus loved). I do not believe that Jesus loved John more than the others, but I do believe it highly possible that John loved Jesus more than the others did. 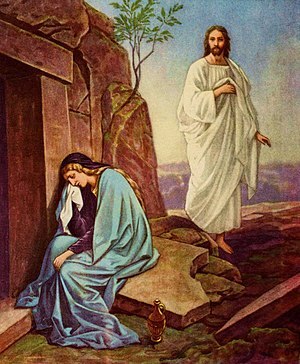 John 20: “1 The first day of the week cometh Mary Magdalene early, when it was yet dark, unto the sepulchre, and seeth the stone taken away from the sepulchre.